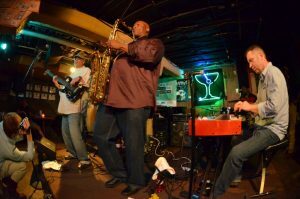 The Funky Groove Oriented Jazz Collective known as fo/mo/deep returns to live performance here in Columbus after a short hiatus from a busy performance schedule this past Spring and Summer. The boys will perform live over at Brother’s Drake this Saturday, November 2nd for Gallery Hop. Gallery Hop is a monthly “hop” to various art galleries and shops throughout the Short North every first Saturday of the month. While the galleries aren’t as plentiful as they used to be in the Short North, the party still happens up and down high street with thousands of people strolling the shops, restaurants and bars. If you’re near 5th and High on Saturday night, fo/mo/deep will be pumping the funk throughout the neighborhood. Best known for their sizzling live performances, the fo/mo/deep groove is rooted in the experimental school of the 70s…a time when jazz, soul and funk were one and the same. Seeking to defy the ordinary, this diverse collective of seasoned pros keeps things stirred up with unpredictable energy that moves. The music harkens back to the days when super groups hypnotized the world with bass driven ensembles and a full-bodied sound that reigned supreme. fo/mo/deep plays music like it’s meant to be…hot, incalculable and emotionally satisfying and fun for all ages.